Cooking at home and eating in is what I happily do most days. Eating out is usually an adventure, rarely my first choice, and always for just a few different reasons–either inspiration or celebration–rarely in between. That means the options are either little known and affordable ethnic spots or special primo product ones. Over all these years of cooking, the food I’ve eaten out has taught me as much as the culinary techniques I’ve learned and practiced. Global cooking of all kinds has so much to offer us. Every country has its own cuisine, with sub-regions and sub-styles and a personalization that goes down to individual family units. If you come home from eating out with a hint of a flavor combo you liked, or a new ingredient, or an unthought of combination, then your own cooking repertoire can only be enhanced. It doesn’t have to be complicated, maybe just one idea. Years ago when I first ate at the restaurant Peasant in downtown New York City, the one simple idea amongst all the great dishes that stuck with me was this: chef Frank DeCarlo served ricotta cheese with the bread instead of butter. Sort of duh but also sort of amazing. These peppers (pictured above) are no new idea! 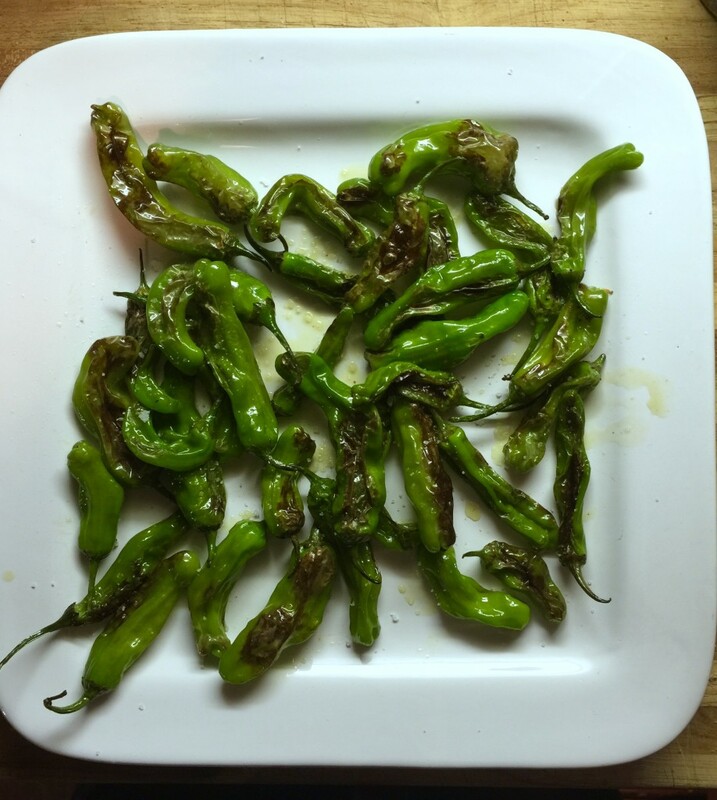 From Japanese to Italian restaurants, Shishito Peppers have become ubiquitous. They make a great cocktail accompaniment. But here’s what is different, they are available widely in the grocery store now. I picked these up at Trader Joe’s.